A while ago I started listening to the excellent podcast Post Mortem with Mick Garris and immediately loved the interview with musician/writer/director Rob Zombie. His thoughts on his career, fascination with classic horror films, and general good-natured demeanor made me wonder why I had never checked out any of his films (or albums), even though they seemed to be chock-full of B-movie references and quirky shock value. 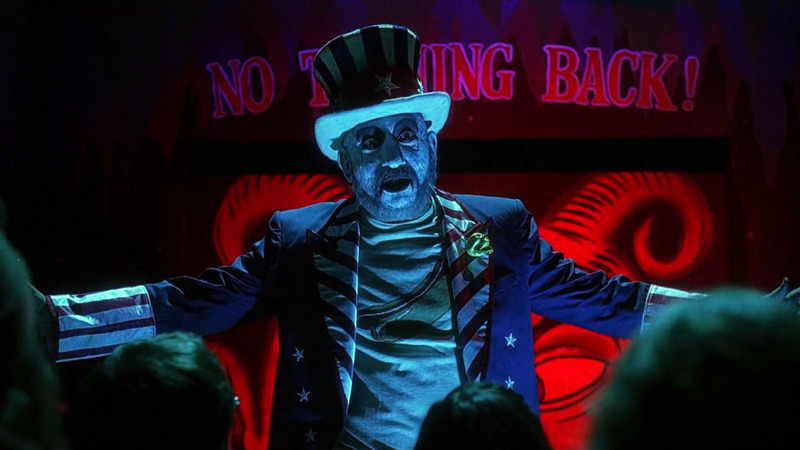 Sure enough, a couple of weeks later I sat down to watch his debut, House of a 1000 Corpses. I’m still not sure what to say. House of a 1000 Corpses reportedly cost around seven million dollars, but it looks like more like $100. The best way to describe it is like The Texas Chainsaw Massacre (1974) on acid. And while that may sound cool, it really isn’t. A group of young friends go in search of the site where an insane local surgeon/serial killer, Dr. Satan, was hanged by the townspeople. They end up at the house of a psycho family who – no surprise there – proceed to imprison and torture them. There are unholy rituals, undead corpses, scalpings, vivisections, and other nasty stuff, all peppered with Zombie’s trademark psychedelic/camp touches, but the result isn’t scary nor funny, falling somewhere between bonkers tribute and bad exploitation flick (there are good ones). However, I found myself occasionally laughing, so I’m still curious. I’ll continue with Zombie’s sequel The Devil’s Rejects (2005). Stay tuned.